Master Darryl Moy (www.darrylmoy.com) teaches Traditional Chinese Martial Arts & Qigong, Senior student of Grandmaster Michael Tse and Chief Instructor of the international, Tse Qigong Centre. Regular classes in Manchester, Sheffield, Liverpool and Wilmslow, teaching Wing Chun Kung Fu, Chun Yuen Kung Fu, Chen Taijiquan and Dayan Qigong. Traditional Chinese Martial Arts, taught traditionally, means no expensive gradings to regularly pay for and no expensive uniform to buy. Teaching is of the highest standard with some skills being more than 1800 years old. - Wing Chun Kung Fu, simple and direct. Wing Chun makes very practical self defence. - Dayan Qigong, over 1800 years old, Qigong is an excellent way to improve your health. - Chun Yuen Quan, a Northern Shaolin Kung Fu, involving bare hand forms and weapons forms. 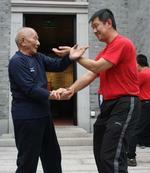 - Chen Taijiquan, the Original style of Taijiquan (Tai Chi Chuan) is Chen Taijiquan. Classes are suitable for adults of all ages and abilities. As well as weekly classes, Wing Chun, Chen Taijiquan, Qigong and Chun Yuen, are also taught at seminars and on residentials. "Pure authentic wing chun look no further"